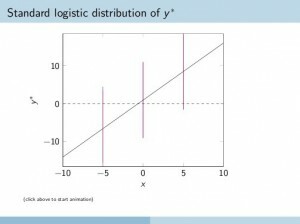 andfollows a standard logistic distribution around its conditional mean. plane confused my students no end. So I wasted half a day on creating a nice 3d-plot for them. After trying several options, I settled on pgfplots.sty, which builds on tikz/pgf, the comprehensive, portable graphics package designed by Tantau (here’s a gallery with most amazing examples of what you can do with this little gem). Plotting data and functions with pgfplots in 2d or 3d is a snap, so that was not too hard. Eventually. source (requires Acrobat reader). So the bell-curves pop out of the plane, in slow motion. Did it help the students to see the light? I have no idea. Here is the source. Thanks for that Alexander. I tweaked an existing example to my needs, but your solution is obviously much more concise! I had a look into the source file animation.tex. The part that creates the animation frames using the parameterized macro doit can be significantly simplified by replacing the whiledo loop with the multiframe command. Note that the parameter names xb and xc had to be prefixed with `r’ to declare them as `real’ numbers (See the doc animate.pdf for details. ).